Sales of song downloads overtook those for physical singles for the first time at the end of 2004. The last week in December saw download sales of 312,000 compared with 282,000 physical singles, according to the British Phonographic Industry (BPI). The download total beats the previous weekly record by more than 20%. Overall album sales also reached a high in 2004, with a 2.6% increase over a record 2003 - with UK-signed artists dominating the charts. Sales show "music is more popular than ever with the British public", said BPI chairman Peter Jamieson. "With the public's fast-growing appetite for downloads, the future looks bright for the single," he added. The round-the-clock access to music download sites is thought to have made online purchasing more convenient and attractive. The 5.7 million legal downloads in 2004 lifted the total singles market by 4%. Download sales figures are soon to be included in the official singles chart. 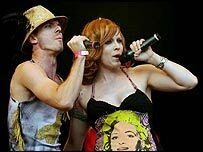 US act the Scissor Sisters pipped British band Keane to the best-selling album of 2004 on the final day of the year. Chart statistics are collated by the Official UK Charts Company, which monitors sales figures across 6,000 stores and internet sites.